I once had a professor, who was fond of criticizing uninspired, half-hearted student efforts as “pedestrian,” in the sense of humdrum and unimaginative. That’s actually the original meaning of the word, back in the days of the Roman Empire, where I think the professor lived his happiest days. Dull and drab. Just your basic wage-earning proletarians, plodding along, rather than the patricians and equestrians, racing on horseback to the Colosseum or an uptown bacchanalia. In Boston, my recent home, I learned that “pedestrian” is also synonymous with “victim,” in the sense of someone mad enough to venture out on foot, among the city’s psychopathic drivers. Stop signs mean nothing to these people, sidewalks do not curb them, you cannot claim sanctuary, you’re always fair game. To be on foot in Boston is simply asking for it. Like the poor schmoes with walk-on roles in Ben Hur, getting shoved in front of a chariot race, or tipped into the lion’s den. On foot in Boston traffic, you’re just dipped in gravy and dropped into a cage of weasels. So walking is not the relaxing pastime it used to be. Sometimes in the parks around Upstate NY, we’ll be the only ones walking – – jumping off the path as off-road bicyclists race past, with helmets and carbon fiber chariots. OK, to each their own. They’re having fun, non-motorized, so happy to see them enjoying the outdoors. We look for trails that are too narrow and strewn with fallen tree trunks for bikers, and continue on our plebian way. 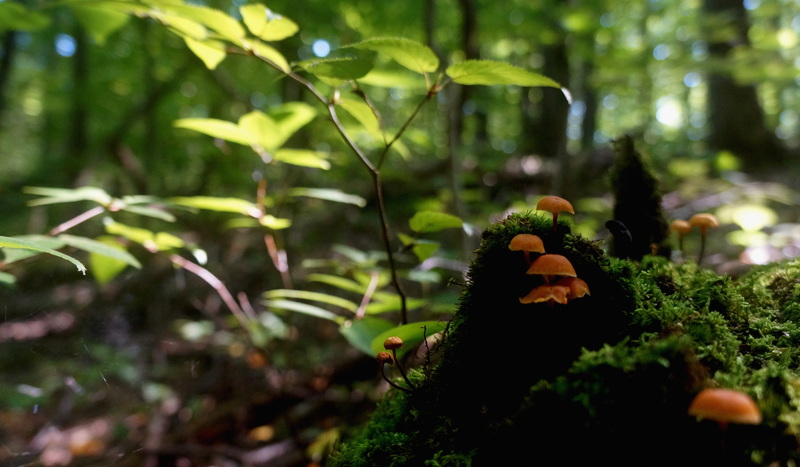 And the stretch of woods we walked through, here at summer’s close, was pretty “pedestrian,” – – just middling-size maples, average ash, basic beeches, a handful of hemlocks, hummocky swamps with ferns beginning to turn brown. 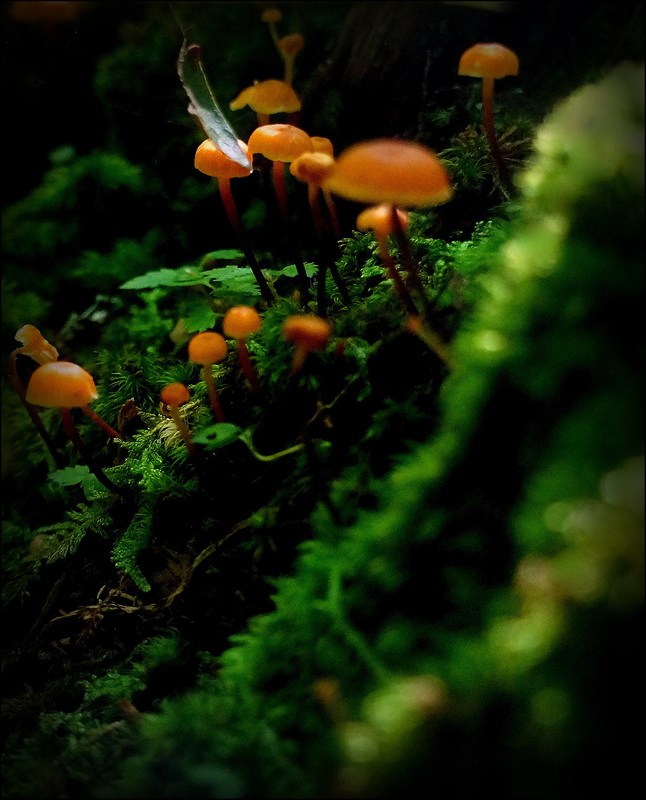 But when we took a break and sat down, there were wonderful miniature landscapes of moss and fungi. 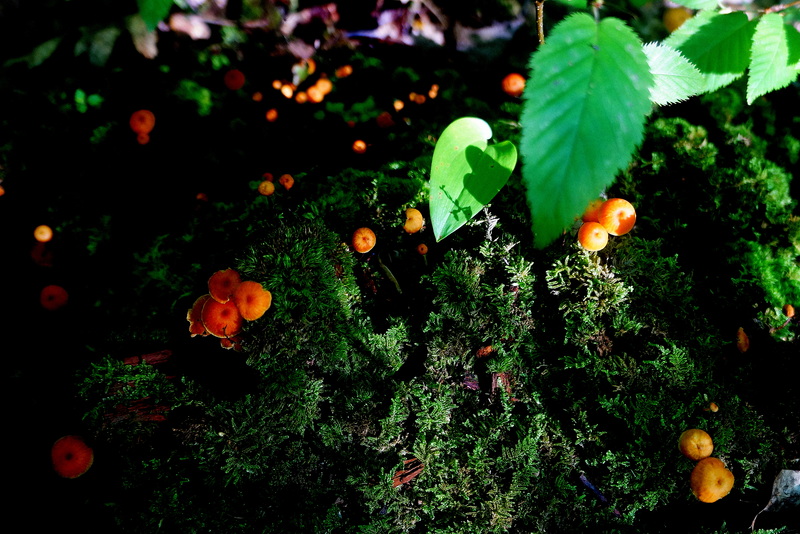 It was getting toward sundown and the tiny mushrooms seemed to glow. Well, speaking as a groundling, worm’s-eye views are sometimes pretty neat! Although, I guess technically, these are more bird’s-eye views. I mean, if the bird was walking, not flying. And we’re not talking ostrich or heron, maybe about grouse-height. Next week, we’ll address “perambulate.” Class is dismissed. → I never tire of Goldenrod. Walks Around The Finger Lakes. September. I’d’ve sworn that first photograph is a downward look at someone wearing a broad round hat. An online dictionary gives as extended meanings of the Latin adjective pedester: ‘Plain, common, without poetic flights, without pathos, prosaic.’ From what you say of being a pedestrian in Boston traffic, you weren’t without poetic frights. Apparently the balletic moves served you well, given that you survived. What a coincidence. Thanks to your link, I commented over there, too. Thanks for visiting the link Steve. Its a really nice photo so it’d stayed in my mind. I didn’t see your comment so it must be in the moderation queue. Yes, it was the first time I’d commented there, so that comment and another got held up for approval. Both have now appeared. Thank you, Mr. K., I’ll take a drop cloth along next time, kind of a soggy area, but it would be a nice perspective. Love it! Short and sweet with a nice dash of academia, about a quarter cup. Yum. Fry ’em up in a pan with a bit of butter and dash of salt, too. I love the description of our Prof as having lived in Roman times. that says it all really. 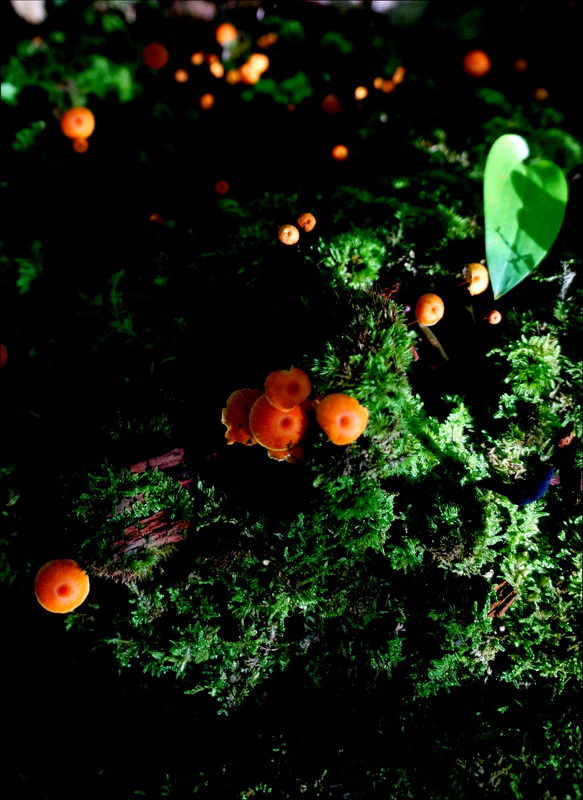 I love the photos those little fungi look like something from a fairy tale. Nothing pedestrian or plebian about them at all. Thank you, Anne, that’s exactly how it struck me, too. Thoroughly enjoyable read, all I can say is, we have no equivalent to Boston down here. Love those photos. Thank you, and congrats on having sane motorists. Ooh, i wouldn’t quite go that far, but definitely more conscious of others. Lovely walk. Nice being a pedestrian with you. Thank you, I enjoy going along on all your world-wide trips too! A walk in the woods is good for the body and mind (unless you get hit by a bicyclist). I have to be very careful when I wander in woods. I try to stay on nice, wide trails because I’m highly allergic to poison ivy. Poison ivy is very adaptive, too — I’ve seen it on sand dunes. Have a great day, Robert. Thanks Neil, yeah, I don’t know if it’s due to warmer weather or what, but there’s an incredible amount of poison ivy in some woods, and man that’s an awful rash. Austin’s most popular trail makes a loop on both sides of the downtown stretch of the Colorado River (called Lady Bird Lake). Lush poison ivy is common alongside that trail, in places even leaning out somewhat into the space where people walk and jog. Occasional signs warn passers-by, but I have to assume not everyone reads them, and many people don’t know how to recognize poison ivy. It is a horrible pest. I’ve read that goats can eat it with impunity, and some places “rent” a herd, to get the plant under control, without the use of herbicides. Once the plant is mostly eaten, then people can use spot treatments of herbicide to finish it off. Love the gorgeous photos and descriptions. Keep your wits about you when back on the beaten path. Hi Pit – yes, I agree, I think the future will have more walk-able and bike-able cities and villages. At least, I hope so! All those wonderful things that those crazy motorists don’t get to see. Hooray for pedestrians, I say! Thanks, Mick, I feel the same way. You see a lot more interesting stuff at walking speed. 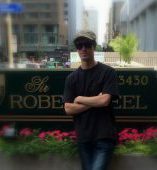 Such fun, reading your posts, Robert! Boston and Seattle are opposites….in Seattle, at least up to a few years ago, the pedestrian was elevated as a god or goddess who could do no wrong. All traffic would stop and wait any time a person on foot approached an intersection. It REALLY took some getting used to, having lived in NYC for so many years. As a pedestrian and as a driver, I had to change my ways. “Free interpretation” is such a nice way of putting it. 🙂 Yes, in NYS it’s the quick and the dead. I have to say, in Geneva and Seneca Falls, drivers are pretty good about stopping at the crosswalks. But it must be strange to have people actually observing all the rules! I’d probably feel a compulsion to teach the kids there how to jaywalk and skeetch behind the cars. Fidalgo Island sounds very nice. There are more connections, but I thought it was interesting that the root the OED referenced was “from root *per- “forward,” hence “in front of, toward, through.” That certainly fits with your account of attempts to get in front of the crowds and make your way through the Boston traffic. Your first photo reminded me of an eroding mountain, seen from the top. My favorite photo’s the second. I think it’s so effective, the way the light is hitting the leaves, while the little mushrooms are highlighted against the dark background. It’s wonderfully composed, and not at all pedestrian. I make oblique references now and then to my favorite professor, and you’ve reminded me of him again. He’s the one who had this sign in his office: Creato, Ero Sum. Very interesting! I think people around here usually say “strollers,” which kinda makes parenthood sound like a stroll in the park. I guess “Overloaded & Frantically Multitasking Conveyance” was too long. Did you ever read “The Professor and the Madman” by Simon Winchester? about the creation of the OED – who’d have thought a book about writing a dictionary could be so wild and interesting. I haven’t read the book. In fact, I’ve not heard about it until now. It looks like a fun read, and it’s on the list. Lecture away, Prof. I knew perambulate before but not as I do now. It appears your mushrooms are having a great time on a nurse log. Pretty little fun guys. This is a great year for mushrooms. So many in the woods now. 🙂 Isn’t it something? Last year & this one, I don’t remember ever seeing so many colorful mushrooms, it really has been fun! I recently saw some of those blackish trumpet-shaped ones that you photographed recently, I don’t think I’ve ever seen them before, but maybe I’m just looking more closely. 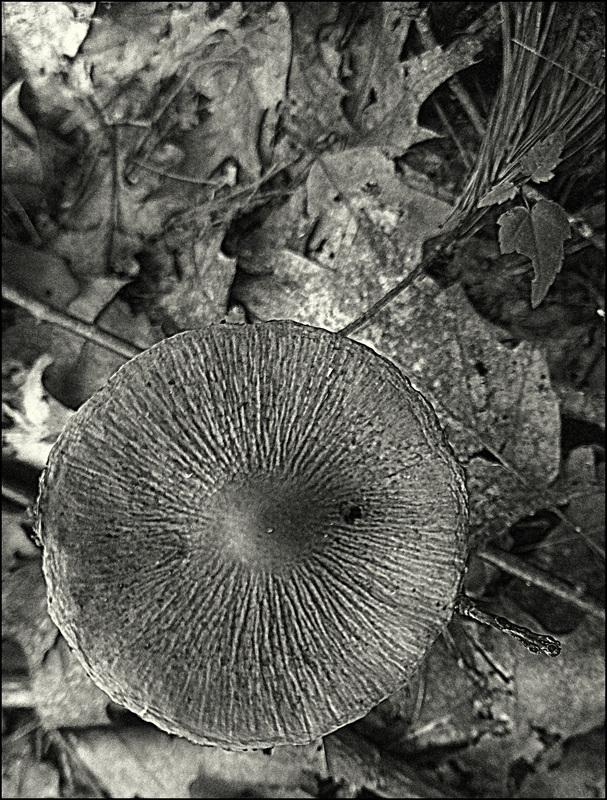 Imagine the macro world, if mushrooms had carbon fiber chariots. Speeding around, sucking up detritus left and right like little Hoovers, terrorizing the toes of the more pedestrian observers. haha! That’s pretty deranged, Dave, I love it! They really do glow, don’t they? I like Dave’s thought of charioteering mushrooms. They could be turned loose on those who race their bikes on paths!